Hereditary red cell membrane disorders are accounted for by nonimmune hereditary hemolytic anemias caused by defects in membrane proteins located in distinct layers of the red cell membrane. Hereditary spherocytosis (HS), hereditary elliptocytosis (HE), and hereditary pyropoikilocytosis (HPP) are disorders of the red cell cytoskeleton, whereas hereditary stomatocytoses are consistent with disorders of cation permeability in the red cell membrane. The term stomatocytosis comes from ancient Greek word stoma (“mouth”) and it has been adopted to describe the typical shape taken by red blood cells because of this disorder. Hereditary stomatocytoses are mostly accounted for by genetic disorders of red cell membranes’ permeability to monovalent cations. These very rare conditions cause hemolytic anemia and frequently macrocytosis. The diagnosis can be confirmed by osmotic gradient ektacytometry, which measures the osmotic resistance and hydration of the red blood cells. Hereditary stomatocytoses are clinically and genetically heterogenous and include the following forms: overhydrated hereditary stomatocytosis (OHS), dehydrated hereditary stomatocytosis (DHS), familial pseudohyperkalemia (FP), and hereditary cryohydrocytosis (CHC). Overhydrated hereditary stomatocytosis (OHS, sometimes also referred to as Stomatocytosis I) manifests cytologically with a a pale-staining band in the erythrocytes. Erythrocytes show shortened survival and increased osmotic fragility that causes hemolytic anemia. Onset occurs during the neonatal period or infancy with hemolytic anemia that may require blood transfusions. Splenomegaly or hepatosplenomegaly is present and hyperbilirubinemia may also occur. Typical complications of hemolytic anemia, such as biliary lithiasis and a tendency to iron overload are common. OHS is transmitted as an autosomal dominant trait, since one parent is often affected (but also de novo mutations are very frequent). After EPB72 mutations were excluded (Zhu et al 1999), heterozygous mutations in the RHAG gene have been found to cause most cases of OHS. Of note, homozygous mutations in the RHAG gene cause RH deficiency syndrome, a rare type of hemolytic anemia of varying severity, which can also be caused by mutations in the RHCE gene. Dehydrated hereditary stomatocytosis (with or without pseudohyperkalemia and/or perinatal edema), also known as hereditary xerocytosis, is an autosomal dominant hemolytic anemia characterized by primary erythrocyte dehydration. DHS patients typically exhibit mild to moderate compensated hemolytic anemia. Patients may also show perinatal edema and pseudohyperkalemia. Complications such as splenomegaly and cholelithiasis, resulting from increased red cell trapping in the spleen and elevated bilirubin levels, respectively, may occur. The course of DHS is frequently associated with iron overload, which may lead to hepatosiderosis. DHS is caused by heterozygous mutation in the PIEZO1 gene. Familial pseudohyperkalemia, which includes pseudohyperkalemia, familial, 2, due to red cell leak (PSHK2) and pseudohyperkalemia Cardiff (cold-sensitive stomatocytosis) is a symptomless, dominantly inherited red cell trait, which shows a ‘passive leak’ of K+ cations into the plasma upon storage of blood at room temperature (or below). There are no haematological abnormalities, although affected individuals may show some mild abnormalities like macrocytosis. All families identified so far have mutations in the ABCB6 gene (2q36), leading to an inherited abnormality in the movement of ions across the red cell membrane, such that when the red cells are cooled they lose potassium into the plasma. Stomatin-deficient cryohydrocytosis (SDCHC) is a rare form of stomatocytosis that is associated with hemolytic anemia, hepatosplenomegaly, cataracts, seizures, mental retardation, and movement disorders. SDCHC is associated with mutations in the SLC2A1 gene (of which mutations can also cause GLUT1 deficiency syndrome 1 and 2, which can also be associated with hemolytic anemia). Spherocytosis type 4 (SPH4) – The stomatocytosis trait has also been found in some patients affected by spherocytosis type 4 (SPH4, Bruce et al. 2005). All these patients had mutations in exon 17 of the SLC4A1 gene. Hereditary spherocytosis refers to a group of heterogeneous disorders: SPH1 is caused by mutation in the ANK1 gene, SPH2 is caused by mutation in the SPTB gene, SPH3 is caused by mutation in the SPTA1 gene, and SPH5 is caused by mutation in the EPB42 gene. Sitosterolemia – Sitosterolemia, also known as phytosterolemia, is an autosomal recessive metabolic condition characterized by intestinal absorption of both cholesterol and plant-derived cholesterol-like molecules, such as sitosterol. Patients with this disorder have very high levels of plant sterols in the plasma and develop tendon and tuberous xanthomas, accelerated atherosclerosis, and premature coronary artery disease. Cases are reported (e.g. Wang 1981 and Kaya 2014) of patients affected by sitosterolemia showing hemolytic anemia with stomatocytic erythrocytes. Sitosterolemia is an autosomal recessive disorder that can be caused by mutations in the ABCG5 and ABCG8 genes. Pseudohyperkalemia Cardiff – No gene has been associated with this condition yet. Stomatocytosis may be characterized here by increased autohemolysis and increased osmotic fragility that causes cold-sensitive hemolysis (temperature-related variant of hereditary stomatocytosis). This disorder clearly apppears to be dominantly inherited. 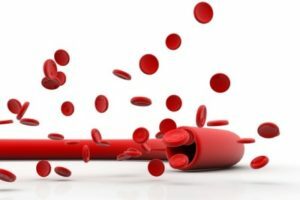 Hemochromatosis type 1 (HFE1) – Hereditary hemochromatosis is an autosomal recessive disorder of iron metabolism wherein the body accumulates excess iron. Excess iron is deposited in a variety of organs, leading to their failure and resulting in serious illnesses including: cirrhosis, hepatomas, diabetes, cardiomyopathy, arthritis, and hypogonadotropic hypogonadism. Hemochromatosis is a genetically heterogenous disorder. HFE1 is caused by a mutation in the HFE gene. In one proband with the HFE mutation, Beutler et al. (1997) found signs of hereditary stomatocytosis as well. Elliptocytosis is a hematologic disorder characterized by elliptically-shaped erythrocytes and a variable degree of hemolytic anemia. Usually inherited as an autosomal dominant, elliptocytosis results from mutation in any one of several genes encoding proteins of the red cell membrane skeleton. Elliptocytosis-1 (EL1) is caused by mutations in the EPB41 gene, EL2 is caused by mutation in the SPTA1 gene, EL3 is caused by mutation in the SPTB gene, and EL4 is caused by mutation in the SLC4A1 gene. Mutations in the GYPC gene can also cause hereditary elliptocytosis (Zanella, 2014 – www.orpha.net). Hereditary pyropoikilocytosis was originally described by Zarkowsky et al. (1975) as a distinct hemolytic anemia characterized by microspherocytosis, poikilocytosis, and an unusual thermal sensitivity of red cells. Hereditary pyropoikilocytosis is caused by mutation in the SPTA1 gene. Posted in Academia, Disease cards, Last Update, Medical Genetics and tagged ABCB6, ABCG5, ABCG8, ANK1, dehydrated hereditary stomatocytosis (DHS), elliptocytosis, EPB41, EPB42, familial pseudohyperkalemia (FP), GYPC, hereditary cryohydrocytosis (CHC), Hereditary red cell membrane disorders, HFE, overhydrated hereditary stomatocytosis (OHS), pyropoikilocytosis, RHAG, RHCE, SLC2A1, SLC4A1, SPTA1, SPTB, stomatocytosis.